We discussed earlier about the complete Elliot-wave cycle consists of 8-wave structure, where 5-wave structure is motive and 3-wave structure is corrective. The complete cycle can also sub-divide further into motive and corrective waves of lower degree. 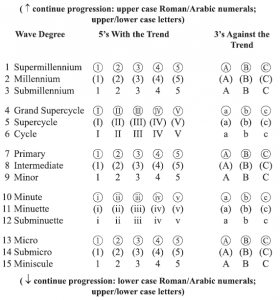 In the above complete cycle wave (1) is motive wave of lower degree in larger degree wave . The same way wave [B] itself is formed of a-b-c corrective pattern of lower degree. It can also be said as correction within corrective. From the above figure it is also clear that motive waves are not necessarily be moving upwards but can be a down move also – wave [A] & [C] are motive waves (formed of 5-wave structure). The same way corrective can also move up which is displayed by wave [B]. There are two wave functions i.e. these are action and reaction. The waves of action are which trends in the same direction of one larger trend. While reactionary waves are the ones which trends in the opposite direction to that of larger degree waves. In the above figure we used different way of marking wave 1 i.e. wave (1) & . This generally is done so that we may know that which is the larger degree & which is lower degree wave. 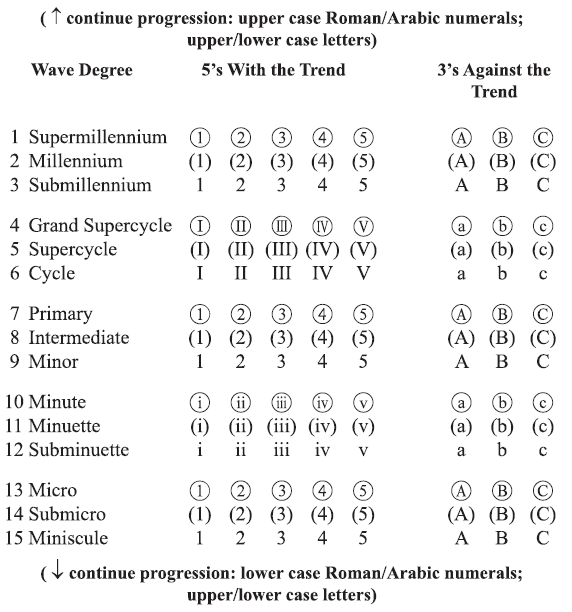 Elliot described the notations & nomenclature for the degrees which he explains from largest to smallest – Grand Supercycle, Supercycle, Cycle, Primary, Intermediate, Minor, Minute, Minuette, Subminuette. The Elliot wave progression consists of motive & corrective waves. The 5-wave structure that consists of three motive waves – 1,3 & 5 and two corrective waves – 2 & 4 is an impulse. There are certain variations of impulse and corrective waves which we will discuss in coming parts.